Each brewery is scored out of 50 points. To be eligible for the list, they need to have been opened by July 1 of the previous year, so the brewery has time to iron out its kinks and we have enough time to visit afterwards (which means Beere in North Vancouver, Mariner in Coquitlam and East Vancouver Brewing Co. in, ahem, East Vancouver aren’t included). Every place has been visited at least four people. Average of everyone’s score is the total. A score below 25 is bad. A score above 32 is good. A score above 36 is very good. A score above 39 is elite. Is it subjective? Absolutely. A little silly? By definition. Unfair to rate something based on, in some cases, just one or two experiences? Yep! Are some of the scores in the individual categories objectively wrong? Probably! But at worse, we think this list is a great argument starter. At worst, we hope it’ll be a decent guide. And if it doesn’t do either…well, we drank (mostly) a lot of tasty beer we otherwise wouldn’t had tried, so we don’t have any regrets. 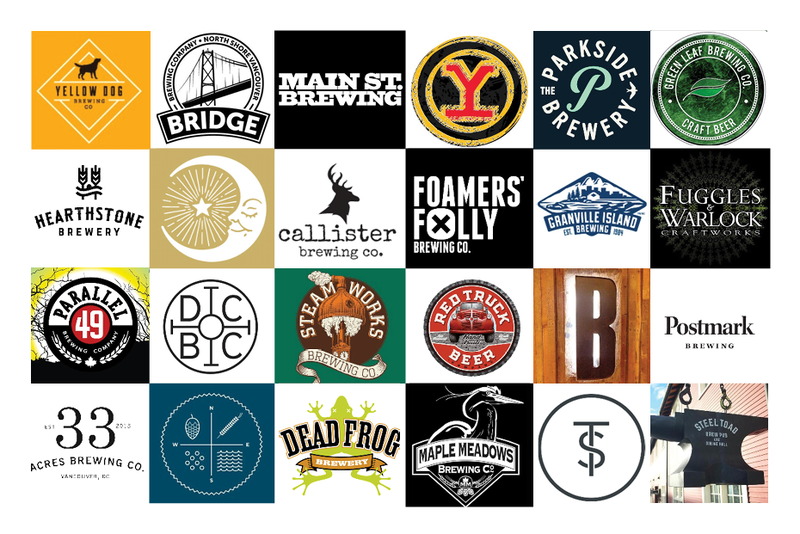 So without further rambling, here are the ratings of (nearly) every brewery in Metro Vancouver. I look forward to reading, and sampling more. This is amazing thus far. Strongly agree with the vast majority of the comments and ratings thus far – while it’s hard to see a brewery that makes such consistently terrible beer as Parkside or Dogwood place higher than breweries like Doan’s who do pretty good beer, I can’t argue the results when other criteria is considered as per your rating system. Can’t wait to see the upper tier results later this week! Need the next update bro. I am cheering on my hometown brewery Trading Post. I am hoping that they come top ten. Great stuff, I recently did this exercise myself, less the methodology. FWIW my top 3 were Yellow Dog, 33 Acres and Four Winds. I get that I like 33 Acres way more than most people, but to rank it below Dead Frog and Red Truck is downright bizarre. Yeah, below Dead Frog and Red Truck seems to have rankled a few people. If there was a larger pool of rankers, that likely wouldn’t have happened, but preferences among a small sample size are what they are — and visits to Red Truck/Dead Frog revealed they were better than we remembered them being in university. Thanks for doing this Justin! This was the best internet reading I’ve had in months. I agree with most of your group’s picks, and I was sure Brassneck and 4 Winds had to be 1-2. I’ve also discovered some new breweries to try, especially Foamers Folly. I’ve been to all the breweries on the list, and the ones in Vancouver many times, and my list would look pretty close to this one. As with others, I’d put 33 Acres quite a bit higher, and Main Street lower. I also think Storm should be lower. It’s a unique and rather hilarious place, and we still always stop there on beer bike tours, but the beer is really pretty bad when it comes down to it. But anyway, good project and list, cheers! There is a 43rd brewery (brew pub, or brewery & hotel) you might be missing called Dockside Brewing on Granville Island. It could be a good contender for your 43rd spot. I would agree with this list for the most part (especially God Tier and lower tiers), but am surprised Twin Sails isn’t higher. Those guys are slaying it. Regardless of ranking I’m just glad that there are breweries out there trying to make flavourful beers. I invite any regular consumer of Bud, Coors, Molson and Labatt’s to step off the well-travelled road and explore. Sure, you’ll come across clunkers from time to time. But one day you will come across a beer that you’ll love. It’s almost a religious experience. Glad to see my fav Yellow Dog near the top. I’ve enjoyed their dog-themed brews for several years. Shop (and drink) locally.